FREQUENTLY ASKED QUESTIONS OR THINGS YOU PROBABLY WANTED TO KNOW ABOUT COPPERCREEK CAMP BUT DIDN’T WANT TO ASK!!! DO I GET PAID ENOUGH? DO I GET DAYS OFF? Maybe. Okay, we will give you a day off once a week and under special, pre-arranged circumstances, more time as needed. Only if you don’t whine though. That’s reserved for the Director…me! WHAT CAN I DO WHEN I HAVE THE DAY OFF? Sleep. That seems the most popular pastime for staff. There’s also lots of hiking, swimming, and scenic attractions near camp. Lassen National Park is only 45 minutes away and Tahoe is just two hours south. It is beautiful country, un-crowded and clean. CAN I USE CAMP EQUIPMENT WHEN I'M OFF? This depends on how much bribe money is paid out to the program director. Some equipment can be used if not needed by camp that day but you will need to ask the directors first. HOW MANY HOURS AM I EXPECTED TO WORK IN A DAY? Far too many but fortunately the program director is human (at least in the beginning) and tries very hard to give you several different hour-long periods off each day. Yep! Especially if you are having fun and doing your job. If you bring old clothes, lots of soap and utilize our showers, you can minimize the risk. If you aren’t dirty occasionally, we may wonder what you are doing. It depends on whether you get to them before the dusty horse staff gets in. None larger than the camp dogs. Bug repellent is as important as soap at Coppercreek. NO. Even if you have the sweetest dog in the world, it will want to eat children after spending nine weeks with them. ARE THE KIDS JUST RICH BRATS? Think of it this way, if they are, they may be good future business contacts. Kids are kids, rich or poor and all need positive attention and wholesome experiences. Most of our campers come from middle to higher income families and 99% are really nice people. We provide as many scholarships as financially possible. WILL YOU APPRECIATE MY INPUT? Sure, as long as it’s not in the middle of a crisis. Less than a U-haul and more than a daypack (both of which have been used by previous staff). The staff manual will fill you in on necessary items. ARE THERE CUTE GUYS/GIRLS ON STAFF? We are all ugly after a week. Friends can visit, but can they move in? No. Unfortunately, our program staff increases as the summer goes on and some are people we never hired. They just came for a “short visit” and stayed. You will notice if your friends hang around too long, the other counselors begin to growl and Directors start adding up the tab. They are welcome for a meal or an evening of activities but then we would like you to focus on your campers. PLEASE ASK FIRST!! Abusing this one gets you dirty looks. WHAT’S YOUR DRINKING AND DRUGS POLICY? It’s pretty simple. Drinking is something you do on your time off away from camp and at no time do you return to duty intoxicated. Please don’t apply if partying is your priority. Drugs are illegal in California so they are illegal at Coppercreek. You can probably already guess what happens if you are caught doing either one on duty. Yep, Greenville is just three miles away and has a phone if you don’t have a car. BUT DUDE, WHAT ABOUT MY BOOMBOX? YOU KNOW I CAN’T LIVE WITHOUT MUSIC! We have lots of lovely music at camp. It comes in the form of laughter, bird songs, the wind in the trees, counselors and campers playing guitars, and campfire songs. By all means, bring your favorite cassette player, phonograph or whatever new, hip technology there is nowadays. but remember we are living in a small community. Stereo competition among the tents gets on everyone’s nerves. We do not have lockers available at this time and IPODS and laptops have been known to disappear. We suggest you bring a locked trunk and mark belongings with your name. We teach low impact camping, the appreciation of nature, and the value of caring for our environment. Yes! We recycle! Yep! It’s pretty straight forward. Stay as clean as you can, shave if you are beardless, keep it neatly trimmed if you are not and don’t start one while you are here. We would rather not have any form of goat-tees, soul patches, scruff below the lip, or lampchops. (Ouch!) Please just ask if you are uncertain. Suggestive t-shirts are out, as are dirty sock-less feet. Wear shoes appropriate to the activity, i.e. sturdy shoes on the trail, not beach sandals. 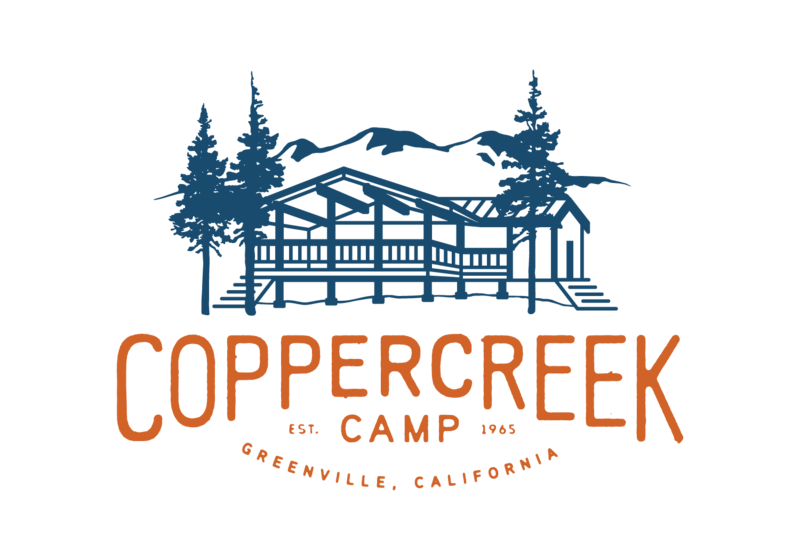 Coppercreek T-shirts are worn out of camp on official business and on opening and closing days. Girls are asked to not wear string bikinis and to keep hair neat and out of the face. Please do not wear the skimpy tank tops that allow your bra-straps to hang out. No bizarre haircuts either. Same with tattoos (they need to be coverable ). Body piercing (other than reasonable ear piercings), including facial and tongue piercings are not acceptable. Be discreet. (Nothing like interviewing someone, hiring them and then not recognizing them when they get to camp!) If this seems hard-nosed, remember we are a business and have a clientele with certain expectations. If campers don’t return or worse, go get their tongue pierced and their back tattooed because their camp counselor did, you don’t have a job. My biggest pet peeve is someone taking the job and then showing up with all this stuff thinking I won’t notice. I do! Let’s talk about it and we can probably work out a reasonable solution to your style of body decoration.